The Duzi 4 Lite camera slider is the result of Cinevate‘s pursuit to perfect its most lightweight and compact slider. The Duzi 4 Slider supports up to 100 lb loads, and offers smooth and consistent slides. The lack of a counterweight helps shooters who like to make quick camera movements by using heavier cameras that don’t require the extra resistance of the flywheel. Like the original Duzi 4 camera slider, the Duzi 4 camera slider Lite is a roller-bearing slider made of hardened aluminum and stainless steel, and featuring solid carbon fiber rails. 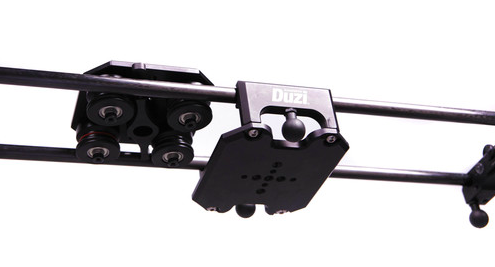 Duzi 4 camera slider comes with six non-scratch, micro-adjustable urethane ball feet, with two on each end as well as two on the slider carriage. The two on the camera slider carriage attach slightly to the side, are suspended, and provide additional support for heavier loads. The Duzi 4 camera slider Lite also supports the dedicated All Terrain Legs, sold separately, which are designed specifically for it. These legs are highly adjustable and capable of compensating for uneven surfaces.